Current Music: Rob St. John & Modern Studies, "The Bold Fisherman"
I love the tinier fish inside the glass of them, the hermit crab, the turtle. I love the way they turn toward one another. 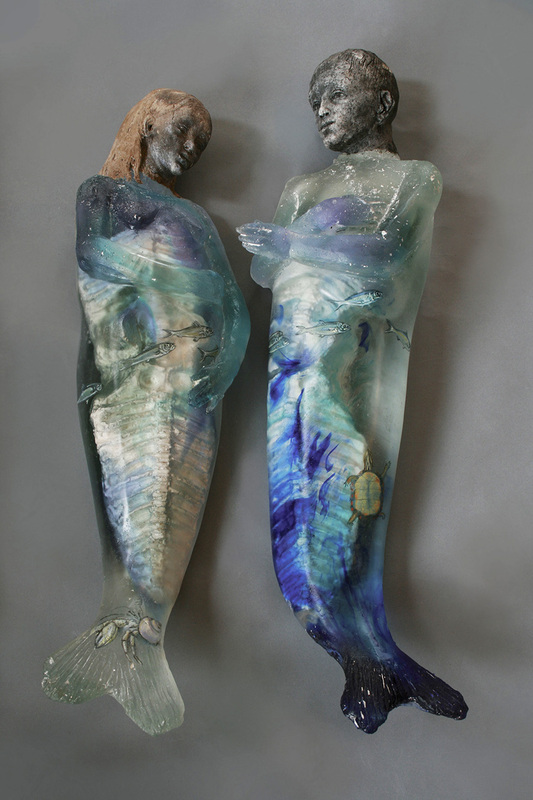 They look like the couple on the lid of an Etruscan sarcophagus, only mer. This is obviously an aesthetic I can get behind. Aw, they are rather wonderful! I was catching up on Tumblr and all of a sudden like three different people linked photosets of the same artist's work. I love this piece best, but some of the others are also very beautiful. The ones with sea-themes are very good art of the sea. I love all the different layers in the glass. Those are so lovely! They have ancient faces, which I think is part of what makes them appeal to me. And the colors and little sea creatures are **great**. In Nova Scotia, I got to wade between hermit crab contests, with krill tickling my feet. These merfolk would have been at home there. Those are so lovely! They have ancient faces, which I think is part of what makes them appeal to me. Yes. I love the change from stone to sea. In Nova Scotia, I got to wade between hermit crab contests, with krill tickling my feet. That sounds marvelous. I am glad you had that! I need to get to the sea soon. Maybe they have them in Cloud, in Scarristack. Oh, lovely. I imagine they do. They made me very happy to discover in the middle of the night. They do look very Etruscan! I was thinking it even before I read your commentary, even! Oh, wow, I love this. Thank you for posting it!